Rice Bucket Challenge: Put Rice In Bucket, Do Not Pour Over Head : Goats and Soda Water is scarce in India, which is a good reason not to do the Ice Bucket Challenge. 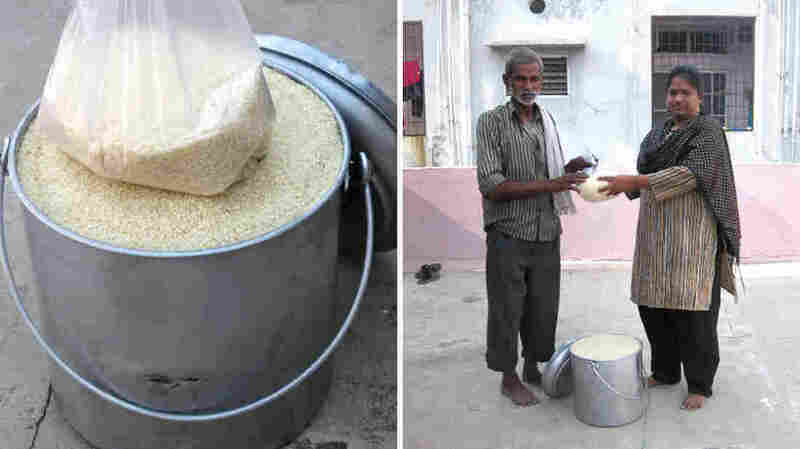 A journalist came up with another option — give a bucket of rice to a hungry person. Her version is going viral. Rice is just as nice as ice when it comes to bucket challenges. Right: Manju Latha Kalanidhi, creator of the Rice Bucket Challenge, gives grains to a hard-working neighbor. There's the Ice Bucket Challenge. And now there's the Rice Bucket Challenge. More than a million people worldwide have poured buckets of ice water over their heads as part of a fund-raising campaign for ALS, or Lou Gehrig's disease. But when word of the challenge made its way to India, where more than 100 million people lack access to clean drinking water, locals weren't exactly eager to drench themselves with the scarce supply. Manju Kalanidhi, a 38-year-old journalist from Hyderabad who reports on the global rice market, put her own twist on the challenge. She calls her version the Rice Bucket Challenge, but don't worry, no grains of rice went to waste. "I personally think the [Ice Bucket Challenge] is ideal for the American demographic," she says. "But in India, we have loads of other causes to promote." Kalanidhi came up with a desi version — that's a Hindi word to describe something Indian. She chose to focus on hunger. A third of India's 1.2 billion people live on less than $1.25 USD a day, and a kilogram of rice, or 2 pounds, costs between 80 cents and a dollar. A family of four would go through roughly 45 pounds of rice a month, she says. That's why she's challenging people to give a bucket of rice, cooked or uncooked, to a person in need. Snap a photo, share it online and, just as with the Ice Bucket Challenge, nominate friends to take part, she suggests. For those who want to help more than one person at a time, she recommends donating to a food charity. She took a photo with her neighbor, along with the rice, and posted it on her personal Facebook page. Responses poured in by the hundreds, prompting her to create a page for the campaign on Saturday. It received a hundred likes in just five hours. As of today, the number of likes has topped 40,000 in what she calls a "social tsunami." With 3 to 4 billion people in the world depending on rice as a dietary staple, the challenge has spread beyond India's borders. People in California, Canada and Hong Kong are among the participants. What if a recipient doesn't want to be photographed — or if the donor thinks it's not a good idea to take a picture? No worries, says Kalanidhi. A photo of the rice bucket will do.